ANTIBOTHIS is a collection of book/ cds anthologies featuring texts and interviews showcasing a variety of ideas that are a genuine alternative to the dogma of conformity. A commitment to disconnect the cables of corporhate coolonization, disinverting cultural reality through the dissemination and dispersion of alternatives vortices of information and infinite chaotic propaganda, speculation, simulation, stimulation, to revolutionize the dynamics of life in a total process of cultural transformation, reclaiming our guts and revolt in the name of imagination in opposition to a toxic life of low awareness, herd mentality and programmed though, infecting human minds and alter their behaviour featuring written texts from John Zerzan, Erik Davies, Joe Ambrose, Chad Hensley, Carl Abrahamsson, Vadge Moore, Nigel Ayers, Pentti Linkola, Adi Newton, Ewen Chardronnet, Critical art Ensemble, Antero Alli, Earth First, Boyd Rice, Robin Rimbaud, V. Vale among many others. Each publication features a cd compilation with artist such as The Master Musicians of Joujouka, Controlled Bleeding, Jarboe, O Yuki Conjugate, Cotton Ferox, Andrey Kiritchenko, Scanner, Rapoon, Anla Courtis, Lydia Lunch, Phillipe Petit, Adi Newton, Zeitkratzer, Pietro Riparbelli, Kal Cahoone, Checkpoint 303 among many others. 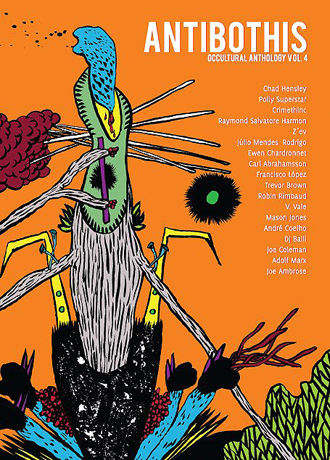 CHAD HENSLEY, POLLY SUPERSTAR, CRIMETHINC, RAYMON SALVATORE HARMON, Z´EV, JÚLIO MENDES RODRIGO, EWEN CHARDRONNET, CARL ABRAHAMSSON, FRANCISCO LOPEZ, TREVOR BROWN, ROBIN RIMBAUD, V. VALE, MASON JONES, ANDRÉ COELHO, DJ BALLI, JOE COLEMAN, ADOLF MARX, JOE AMBROSE. As usual with this excellent Portuguese anthology, we find ourselves positioned in a gap between the old and the new on many levels. The occultural, post-industrial (as in the music/subculture, not as in general history), avant garde environment swings easily between play and philosophy, between genuine transformation and abstracted discourse, between pure experimentation and thorough thinking. Most of it is still fairly fresh, I have to say. If there’s some kind of code that unites these disparate voices, it’s an antithetical stance against the passive collective, expressed in eloquent experiments. Single voices spewing out disdain or frustration in honest, poetical and sometimes scary bursts.